Disneyland began as a small theme park in 1955, when Walt Disney brought his dream to life in Anaheim, California. It has since grown to comprise two parks — Disneyland and Disney California Adventure Park — plus Downtown Disney, an entertainment, dining and shopping district. Still, it’s smaller in size than Disney World in Orlando, making it a manageable option for families with little ones. Before you go, here’s what you need to know about rides, dining options, accommodations and more. Disneyland has eight magical lands (many of which are also at the Magic Kingdom in Orlando): Main Street U.S.A., Tomorrowland, Fantasyland, Mickey’s Toontown, Frontierland, Critter Country, New Orleans Square and Adventureland. All areas feature games, character experiences, dining options and of course, rides. Some of the most popular attractions and shows reside in Disneyland, such as Dumbo the Flying Elephant and Big Thunder Mountain Railroad. 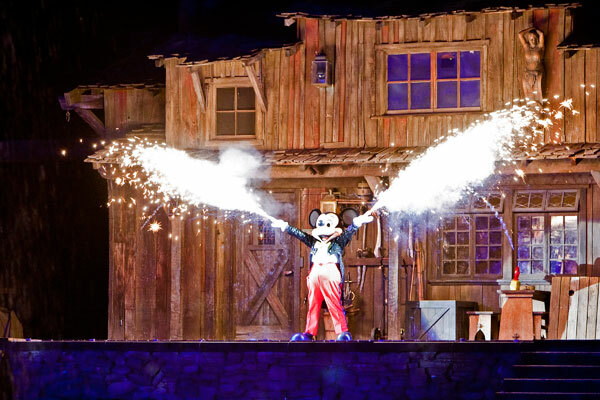 Don’t miss the Fantasmic! show, Mickey’s Soundsational Parade or the fireworks display, which takes place daily. Eight more magical areas are on offer at the second theme park, Disney California Adventure Park. Explore Buena Vista Street, Cars Land, Grizzly Peak, Grizzly Peak Airfield, Paradise Pier, Pacific Wharf, “a bug’s land” and Hollywood Land. Popular attractions include The Little Mermaid – Ariel’s Undersea Adventure, the Twilight Zone Tower of Terror and Mickey’s Fun Wheel. The popular World of Color nightly spectacular is one of the park’s classic events not to be missed. And new for 2015, For the First Time in Forever – A Frozen Sing-Along Celebration invites families to experience Arendelle in 3D with Anna, Elsa and Kristoff in Hollywood Land. Located just down the strip from the main entrances to the theme parks, Downtown Disney includes restaurants, shops and live entertainment. Families can grab quick bites from places like Earl of Sandwich or Napolini, or sit down for meals together at ESPN Zone and the Rainforest Cafe. ESPN Zone is also home to a 10,000-square-foot sports arcade, offering even more fun for families outside the theme parks. There is also an AMC movie theater and venues for live music and shows. For souvenirs, stop by one of the many shops and boutiques that line the district, such as The LEGO Store, Anna & Elsa’s Boutique, RIDEMAKERZ and World of Disney. Disneyland Resort is open year-round and with its Southern California location, the weather is almost always sunny and in the 70s. Families can visit any time of the year for a magical experience, though lines are bound to be shorter during mid-week visits in the shoulder seasons — mid-September through mid-November and mid-April through mid-May — as well as after the holidays and before spring break. The trade-off is that the park often schedules ride and attraction refurbishments during these less busy times. It’s also nice to visit during the holidays (though it’s crowded) for seasonal events, like the Christmas Fantasy Parade and Haunted Mansion Holiday, or summer vacation, when hours are often extended. A few rides that aren’t to be missed with toddlers and pre-school children include Dumbo the Flying Elephant, Chip ‘n Dale Treehouse, Alice in Wonderland, Goofy’s Playhouse, Mad Tea Party (an original ride from 1955) and anything in Mickey’s Toontown. None of them have height requirements. Stop by Mickey and Minnie’s houses for character meet-and-greets and photo souvenirs. For the elementary crowd and even some tweens, get in line for Autopia (an original ride from 1955), King Triton’s Carousel, Mater’s Junkyard Jamboree, Toy Story Midway Mania and Tarzan’s Treehouse. All have shorter height requirements (minimum 32 inches), and none are scary or too loud. Bypass the slower rides and head straight for the thrills with teens. Radiator Springs Racers, Big Thunder Mountain Railroad, Space Mountain, Splash Mountain and California Screamin’ are among the most popular rides at the park. All have height requirements of 40 inches or taller. Tip: To avoid long wait times, head to these rides during the evening Fantasmic! show — you can always catch the later showing. Families are invited to use the picnic pavilion outside the entrances to the parks, but they can also bring food into the park — a convenience for all, but particularly those with food allergies. Note: Glass containers, rolling coolers and large storage containers (24 inches or more) are not permitted. If you have an infant, transport formula and food in plastic containers and head to the Baby Care Center, where you can use a microwave to warm bottles. If you’re looking for some downtime, stop by a casual sit-down restaurant like Big Thunder Ranch Barbecue or Cafe Orleans. On the other hand, quick service options include Daisy’s Diner, The Golden Horseshoe and Hungry Bear Restaurant. Dining options are offered in all eight lands throughout the park, and some take reservations. Popular sit-down restaurants include Alfresco Tasting Terrace and Carthay Circle Restaurant, which offer slightly upscale service. Wine Country Trattoria is another good choice and is a bit more casual. For on-the-go meals, stop by Award Wieners, Boardwalk Pizza & Pasta or Fairfax Market — the latter offers vegetarian options. Downtown Disney is home to a plethora of dining options that range from quick service options to upscale restaurants. Enjoy Starbucks, Wetzel’s Pretzels and Jamba Juice for on-the-go snacks and meals. For a casual spot, head to Tortilla Jo’s, Naples Ristorante e Pizzeria or the La Brea Bakery Cafe. Crossroads at House of Blues, ESPN Zone and the Ralph Brennan’s Jazz Kitchen offer families sit-down meals that are themed and sure to entertain kids. For a special experience, visit Catal Restaurant – its menu features classic kids’ options, while offering gourmet Mediterranean cuisine and signature cocktails for adults. For a meal your kids will never forget, book a character dining experience. Ariel’s Grotto in Disney California Adventure Park offers breakfast and lunch with your child’s favorite Disney princesses. At Plaza Inn in Disneyland, families can fuel up for the day with the Minnie & Friends Breakfast. Additional character dining experiences are offered at Disneyland Resort hotels. Reservations are recommended for all. Stay at a hotel with Disney perks. 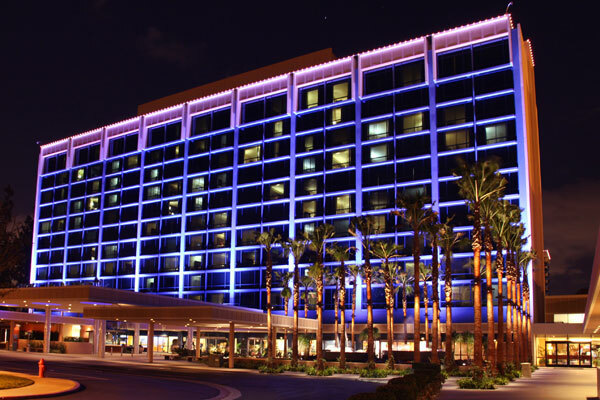 All of the official Disneyland Resort Hotels — Disneyland Hotel, Disney’s Grand California Hotel & Spa and Disney’s Paradise Pier Hotel — offer early entry to the two parks, both of which are located right next to these properties. They also offer great views of the evening fireworks shows and are walking distance to all of the attractions. Other nearby hotels offer shuttle service to and from the resort. 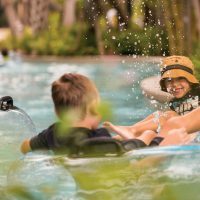 For help selecting which property is right for your family, see our guide to choosing a Disneyland Resort hotel. Tip: Ask about FASTPASS promotions at your hotel. Some Disneyland Resort hotels offer permanent FASTPASS tickets that allow families to use it at any time during their stay for any of the participating attractions, rides and shows. Since the entrances to the two theme parks within the Disneyland Resort are just steps from each other, seeing both in the same day is possible (we didn’t say easy; just possible). Purchase Park Hopper Tickets to save on admission to both parks and enjoy same-day access. On the day you plan to visit the park, use your general admission ticket for FASTPASS on select rides; FASTPASS choices cannot be reserved in advance of your visit, and they book up quickly for popular rides. The rides and attractions that offer FASTPASS service have a Return Time display sign that suggests a later time to visit. If this time works for your family, insert your general admission ticket into the machine below the sign. It will issue a FASTPASS ticket with the return time printed on it. Simply come back to that ride or attraction at that time, present your FASTPASS ticket and enjoy a much shorter wait time. Families must wait until the time on their FASTPASS ticket has expired before they can sign up for another one at another ride. Disney FASTPASS tickets are also available for World of Color and Fantasmic! FASTPASS tickets for shows do not conflict with FASTPASS tickets for rides, so sign up for both on the day(s) you plan to visit the park. Try the Rider Switch program and Single Rider lines. When one child wants to go on a ride, but another does not, parents should try the Rider Switch program. All family members (riders and non-riders) get in line at the attraction. Simply tell all attendants on your way to boarding that you and your partner want to try the Rider Switch program. The first parent rides while the other waits in a designated area with a Rider Switch Pass. When the first parent returns, the second boards the ride while the first waits with the other kids. If a child is tall enough to ride alone, allow them to enter the Single Rider line at the attraction of their choice to bypass the main line. The Rider Switch program and Single Rider lines are not offered at all attractions. Take advantage of free parking at Downtown Disney. If your family is staying at a hotel or resort that is not within walking distance of Disneyland Resort or one that does not offer shuttle service, take advantage of the free parking at Downtown Disney. All guests receive up to three or five hours with validation from participating properties (ask at your hotel). Downtown Disney is within walking distance of both theme parks. The parks are family-friendly for infants and little ones, and both Disneyland and Disney California Adventure Park feature Baby Care Centers. The centers are quiet and clean and provide a place to rest, nurse and change diapers. You can find a Baby Care Center next to the Plaza Inn Restaurant in Disneyland, and in the Pacific Wharf area in Disney California Adventure Park. There are even infant-friendly rides. While you will need to do the Rider Switch on the bigger, faster rides, infants can sit on your lap in the slower rides, such as “It’s a Small World,” Pirates of the Caribbean, Jungle Cruise and the Disneyland railroad.